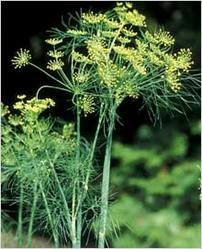 Common Name : Dill, Dill Weed, Garden Dill. Part Used : Fruits And Leaves. Habitat : It is found in tropical and sub-tropical parts of india and cultivated throughout india. Uses : The fruits are acrid, aromatic, bitter, digestive, carminative, stomachic, stimulant, antispasmodic, antihelmintic, anodyne, anti-inflammatory, diuretic, emmenagogue, galactagogue, expectorant, cardiotonic, febrifuge, antispasmodic and antidysenteric. It is useful in flatulence, colic, dyspepsia, intestinal worms, digestive problems, insomnia, inflammation, hiccough, cough, asthma, bronchitis, fever, ulcers, skin diseases, haemorrhoids and cardiac debility. It acts as stimulant for lactation. Fruits and leaves are used as spice for flavoring salads, soups, pickles and breads, mainly by food industry. It is also used as insecticide. Dill's essential oil relieves intestinal spasms and griping and helps to settle colic, hence it is often used in gripe water mixtures. Also used in making vinegar & as a flavouring in pickled gherkins.